In 2013, I was most fortunate to be awarded the prize of being selected for the prize of self-nominated study tour, by which I received $500 to put towards a course of my own interest. With this riding on the back of also receiving the most outstanding member award for 2012, I put all my money together and set off on an adventure sure to change my life. 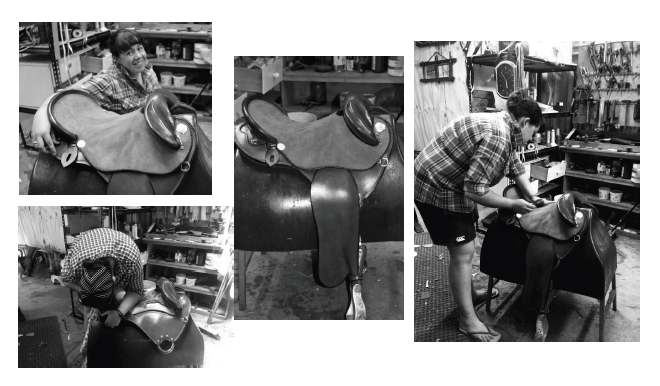 I chose to put my money towards funding a trip to Quirindi in NSW to attend a saddle making school. Something I had always wanted to undertake and was high priority on my 'bucket list', I made it my mission to do this course and become the first person in Tasmania to participate in this one in particular. In late November, I set off. Boarded a plane in Launceston, set for Tamworth NSW, Via Melbourne then onto Sydney. Excitement really hit when I got on the small Qantas propeller plane bound for Tamworth, but excitement soon disappeared when we hit massive turbulence and a thunderstorm just out of Sydney. Travel sickness on a plane that size is most undesirable!! So the plane landed and I was dam happy about that! Was at an airport smaller, yes that's right, smaller then Launceston. I collected my bag and that was where the next week, an awesome exciting week would start. So Greg picked me up, packed me in the car and we set off to Bunnings, I fitted right in and felt immediately like the family, I taught him a few things about hardware and about sharpening rouge's. When we hit the road we headed for Quirindi, a further hour down the road. There was thunder and lightning and heaps of rain, then hail and some more rain. Blissful weather. Once we got to Quirindi late Saturday afternoon, the formalities began. We got talking so he could understand some more about me, where I was from, what sort of riding I did and how I wanted to build my saddle. He asked me to start doing some drawings so he would envisage what I wanted to build. Little did he know I was the most ridiculously organised person in the world and had already drawn exactly what I wanted. He gave credit to my keen-ness and my preparedness. On the Saturday afternoon we looked at the tree, and sat, and looked, and sat and looked some more. We put on some proxy stirrup leathers to establish what length my fenders needed to be. This was when it started to sink in that this was happening, it was really really happening. After a long, stressful day flying, I called it quits for the night and hit the hay ready to start on my saddle the next day. So Sunday morning came, I woke early and was flinging up the shed roller door at around 6.30. My keenness was duly noted and I got told that if I wished to start so early I needed to come bearing gifts, mainly that of brown milky warmness that is coffee, and that my friends is where it began. I can't tell you the exact specifics of how the seat was built in my saddle, as I won't give away all the secrets. It's an eye opener but it all made perfect sense when Greg explained it all. On the Sunday morning, we unrolled my leather side to inspect it. It was gorgeous. Simply beautiful. There are no words used to explain how a side of beautiful, rich chestnut coloured Herman Oak leather looks, let alone feels. For those that don't know, Herman oak is a thick, tough leather to cut. It is hard wearing and ages beautifully. Herman oak leather is generally from the sides of beasts in cool to cold climates, very similar to Tasmania. This leather is so much thicker and stronger because it needs to handle to cooler harsher climates. Once we had inspected the leather, the planning of the positioning of the templates of the pieces in which were to be cut from the side began, the fenders had to be made from identical leather of the same thickness with no marks. Everything had to be thought about logically. Once this was done, I covered my knee rolls. A template was made and the stitching was done. It consisted of a two handed stitch with one continuous piece of string with a needle at either end. Once this was done, the basis of a saddle was starting to take place. Over the duration of the next few days, the saddle quickly took place. The skirt was cut and stitched and hardware was added. The seat was shaped and moulded and the cantle cover was created. Everything was beginning to take shape. FINALLY!! On the Thursday, I had a quiet day. Greg had to take his son in for his P's driving text, so his daughter and I went for a drive to check out the beautiful scenery. We headed out to the New England Highway and went for a drive in her Subaru Brumby. It was a beautiful day with whips of wind, and just the right amount of warmth. Thursday afternoon, we got back into it. We fitted the skirts on and got the seat glued on. EXCTIEMENT EXCITEMENT!! MY SADDLE WAS ALMOST DONE!! Friday morning it was on! All that was left was to stitch the seat, screw on the Conchos and get it ready for photos. That was soon done and in less time than Greg thought. My saddle was made. I was so chuffed. I polished it and brushed the seat getting it ready for a photo. The photos were taken and I couldn't have been happier. There was blood, sweat and a lot of tears that went into the saddle. There were tantrums and moments when I doubted everything that I was doing, but I did it. I finally did it! I had finished a day early and had Saturday to kill. So the offer was laid on the table to go driving out on the stock routes with Greg's daughter, Kristen. I jumped at the opportunity to do something that was never done in Tasmania. There Kristen and I handled 500 head of Black Angus cattle up and down this stretch of road. Road trains and all roaring past. Some slowed right down and were really respectful of the horses and cattle, but others would drive straight through the mob, blowing the horn and all. Sometimes heading the mod off meant galloping up the highway, fun adrenaline pumping stuff. I was living the dream and riding in a saddle that I had just finished making the day before. I was so proud of myself. So we got sun burnt, put up with horrible black flies and smelt of horse sweat. But I had lived an experience that I would never have a chance to do again and I loved every minute of it. We got back unpacked the horses, cleaned up and headed to the pub for my last night in Quirindi. The Terminus was holding their annual beach party and it was time to let our hair down. Saturday night turned into Sunday morning, we headed to bed ready for an early start so Kristen could go back driving and I could go to the airport to start my journey home. This consisted of packing my back, including my saddle into my big Wrangler bag. I got it in and weighed it, once, twice, three times. It was so boarder line on my luggage allowance of 20kg I was pushing my luck. When I got to Tamworth airport and put my bag on the scales it weighed EXACTLY 20kg, not 20.1 or 19.9 but 20kg, perfection!! I was stoked!! Now I could board the plane and head home, my journey was over. I had the time of my life and had learned something so wonderful and had a stunning saddle to show from this. I simply cannot fathom how much I enjoyed this course and how much I encourage people to do it. I will most likely go back and do it again in another 5 or 6 years I enjoyed it that much. I thank Rural Youth for helping financially with this opportunity. It has given me a gift to last a lifetime.